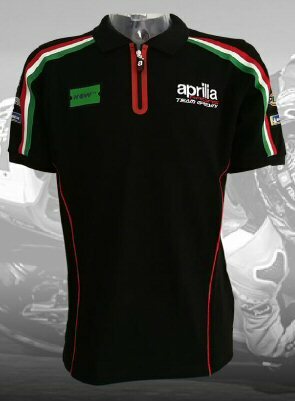 This official Aprilia product is the exact same Polo Shirt as worn by Aprilia's factory team in the 2018 Moto GP World Championship. A classy and well tailored shirt; this is a perfect piece for all your favorite motorcycling events. Made from 100% Polyester, with numerous sewn-on sponsor and team patches. Please note: These are tailored in European proportions, order one size larger than normal to ensure a good fit. A detailed sizing chart can be found at the bottom of this page. Aprilia 2010 World SBK Champions T-Shirt -89953x For longtime Aprilia fans, 2010 was the fulfillment of a longtime promise; Aprilia would one day lift the WSBK championship.